Belle, a beautiful mixed-breed dog, is going to be visiting the Children’s Room on several different dates this spring. Belle just loves to listen to stories, and is hoping that some of you will come and read to her! Her person, Nancy, is a retired special-ed teacher and a grandmother, who adopted Belle 6 years ago, and has helped her to earn her Canine Good Citizen certification and R.E.A.D. training. She will be bringing Belle to visit on Wednesday, April 13 from 3:30 to 4:30 in the afternoon. They will return on Saturday, April 16, from10:30 to 11:30 in the morning. “Team Belle” will also visit in May and June. To sign up to read to Belle, or for more information, please call us at 673-2288 or visit our website calendar at www.amherst.lib.nh.us. 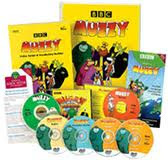 Little Pim DVD's for very young children, and Muzzy programs for elementary-age children. These are both award-winning approaches to early foreign-language acquisition, so come on in, and give them a try! Programs in French, Spanish, and Mandarin Chinese are available. Wow! Even though we were here in cold, snowy New Hampshire for our vacation week---we had a lot of fun! Several hardy souls made it out on a stormy Monday to watch "Lilo and Stitch" and munch on popcorn. On Tuesday, we got in touch with our 'inner dancers'---dressing up in grass skirts, and movin' to some tropical tunes! Wednesday's Indoor Beach Party was a big hit---we had fresh fruit smoothies and pretzels to snack on while listening to stories from the seaside---then Miss Sarah got everyone up and moving to the "Boogie Board Boogie" and other original songs. Thanks so much to Miss Sarah's helpers---Meghan (smoothie-maker extraoridinare! ), Ben (headwaiter at the smoothie table), and Cassandra(expert facepainter!). Thursday's Craft Club got together and made some amazing Lion Pillows---it was hard work, but they were up to the challenge---the pillows came out great. Thanks to Kali and Shelley for helping out! Check out the slideshow to the right to see more pictures!